In order to pass through the Islands of Special Event, it is necessary to have Provision - Scotch eggs. There are 60 units of Provision available. Provision refills over time, 1 unit of Scotch eggs is added per every 5 minutes. You can find the countdown timer under the Provision icon in the upper right corner of the screen. The Provision will be added to your account whether you're currently playing or not. 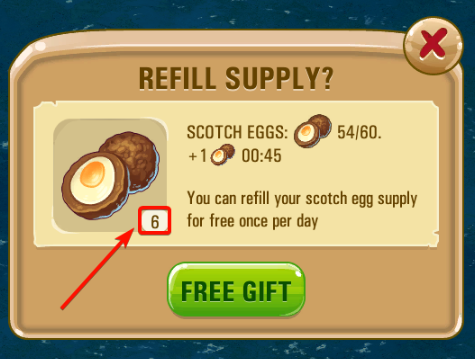 You can also use a free refill to get the maximum amount of Provision. This feature is available once per 24 hours. Please note: the amount of Provision will not extend its overall maximum. E.g., on the picture below you can see that only 6 units of Scotch eggs will be added.